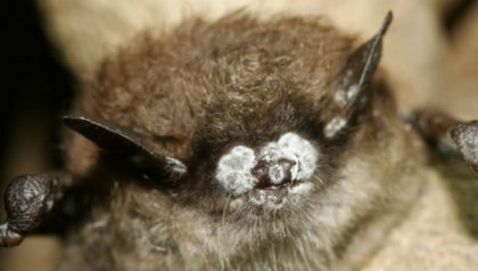 It has been estimated by scientists that close to 5.7 million bats in the United States and Canada have been killed by white nose syndrome, according to scientists studying the problem. A fungus causes the white nose. It causes the bats to wake up from their winter hibernation and then die after they take flight into the cold air while searching for insects in a doomed effort. The problem was first found in a cave west of Albany in 2006. United States federal authorities say that infected bats have been discovered in 16 states ranging from the Northeast to the South and as far west as Kentucky and Indiana. Four Canadian provinces have also said there have been bats found in their regions. The severity of the threat to bats is evidenced by the new estimate of infected bats, according to the United States Fish and Wildlife Service. The United States Fish and Wildlife Service has called for a moratorium on caving activities in the affected regions of the country and has also suggested to those who walk into caves should have their clothes and shoes and equipment destroyed or at least decontaminated when their expedition is complete so they can end the spread of the problem. Is It True That Attending Any but a Top-Tier Law School Is a Personal and Financial Mistake?